Exclusively developed for dentists and dental offices, and helps code common dental procedures with more efficiency. Features 2019 CDT, ICD-10-CM and HCPCS Level II code sets, specific to dental services, all in one resource. 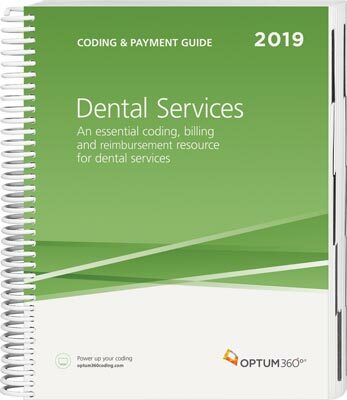 An essential dental coding, billing, and reimbursement resource. Each code includes its official description and lay description, coding tip, documentation and reimbursement tips, Medicare edits, RVUs and is cross-coded to common ICD-10-CM diagnosis codes to complete the coding process. Getting to the code information you need has never been so easy. Code icons. Quickly identify new and revised procedure codes related to dental services. CCI edits. Includes CCI edits for CDT, CPT® and HCPCS procedure codes in a special section with quarterly updates available online.